THIS MONTH WE ARE GOING TO TALK "TIRE STAGGER". STAGGER IS NOTHING MORE THAN THE DIFFERENCE OF THE CIRCUMFERENCE OF TWO TIRES. now this is stagger! 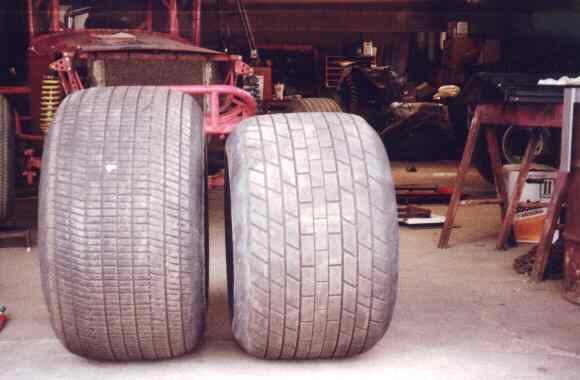 the tire on the left measures 105", while the one on the right measures 92", which would give you 13" (105-92=13) of stagger!! 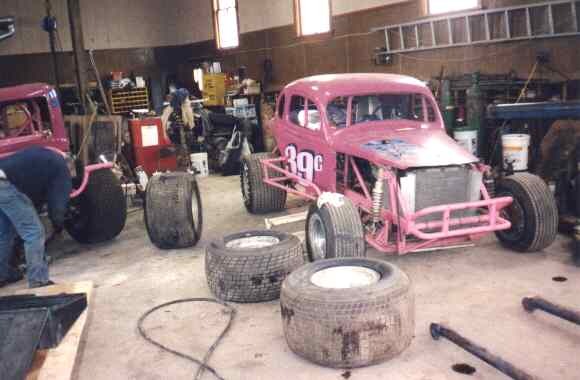 might be the hot set up for a sprinter, but it just ain't going to work for the average vintage stock car!!! YOU SHOULD NEVER ASSUME THAT THE SIZE STAMPED ON THE TIRE IS WHAT SIZE IT WILL BE WHEN MOUNTED AND AIRED UP!! THERE ARE BASICALLY TWO WAYS TO MEASURE TIRE CIRCUMFERENCE. YOU CAN USE A TAPE MEASURE OR A STAGGER STICK. 1. USE A NARROW, FLEXIBLE TAPE, DON'T USE A WIDE HEAVY CARPENTERS TAPE. 6. MAKE SURE TIRES ARE CLEAN! THE STAGGER STICK IS NOT EXACTLY NEW, BUT THROUGH THE MASS PRODUCTION OF THEM LATELY THE AVERAGE WEEKEND WARRIOR CAN AND SHOULD HAVE ONE. YOU CAN BUY ONE BRAND NEW FOR $45.00-$55.00 AND I HAVE SEEN THEM AT SWAP MEETS IN THE $25.00-$35.00 RANGE. 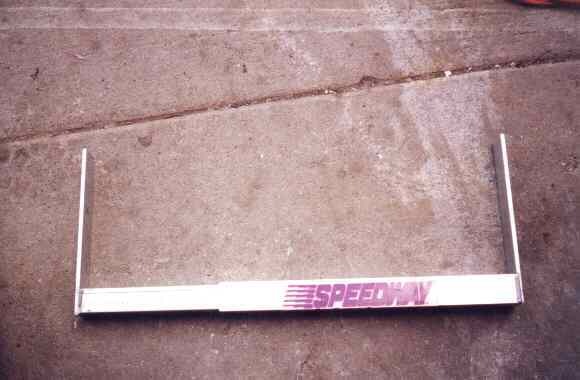 here's a pic of a stagger stick. the tube on the left is calibrated and slides in and out of the right tube. 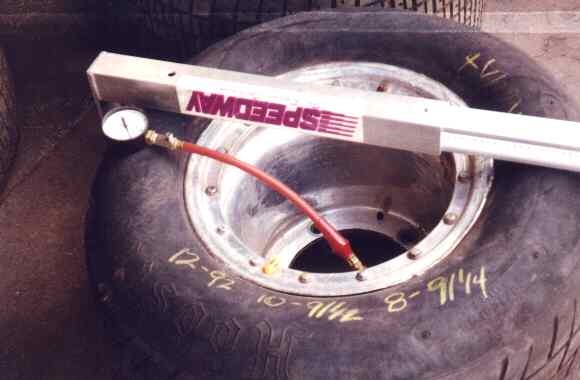 simply slide it over the tire and read the ruler on the left tube. I PREFER THE STICK MYSELF. YOU CAN MEASURE TIRES WHILE THEY ARE ON THE CAR WITHOUT JACKING IT UP. YOU CAN USE IT TO CLEAN THE TIRES AS YOU SLIDE IT OVER THE TIRE. IT'S VERY FAST AND EASY TO USE, MAKING THOSE "IN THE PIT THRASHES" A HECK OF A LOT EASIER. WARNING: IF YOU BUY A STICK YOU WILL FIND EVERYONE IN THE PITS THAT DOESN'T HAVE ONE WILL SOON BECOME YOUR FRIEND!!! WHEN GETTING READY TO MEASURE TIRES GIVE YOURSELF PLENTY OF ROOM TO LAY THEM OUT IN A ROW WITH SOME ROOM TO WORK. THIS WILL MAKE THE JOB EASIER AND MUCH MORE PRODUCTIVE. here we are at j&m repair and welding in holly springs, ia. starting to lay out some tires to be measured. give yourself plenty of room. I'VE FOUND THAT IT'S EASIEST TO AIR ALL OF THE TIRES TO BE MEASURED TO THE MAXIMUM AIR PRESSURE YOU PLAN TO RUN FIRST. MEASURE THE TIRES AT ALL OF THE PRESSURES YOU THINK YOU MIGHT BE RUNNING. FOR EXAMPLE, WE RUN OUR REAR TIRES ANYWHERE FROM 12 LBS TO 8 LBS. AS YOU MEASURE THEM MARK ON THE TIRE WHAT SIZE THEY ARE. YOU WILL BE AMAZED AT THE WAY MANY TIRES CHANGE WITH A 4 LBS DIFFERENCE! here's the basic tools needed to do some serious tire measuring, a stagger stick, pressure gauge, and a chunk of grease pencil. note how a 4 lbs change on this tire changed the circumference 3/4"! !